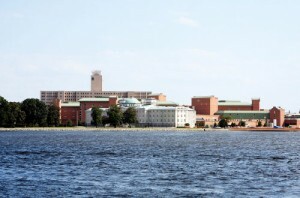 The Naval Medical Center at Portsmouth, Virginia lives up to its motto of “First and Finest.” Established in 1827, the medical center is the Navy’s longest continuously operating hospital. The facility recently underwent an expansion to a state-of-the-art 350,000 square foot hospital, called Charette Health Care Center. The base employs a staff of over 4,000 and provides care to over 400,000 residents of the Hampton Roads region, including active duty servicemen and their families. The hospital also partners with the American Red Cross, offering many wonderful volunteer opportunities. Also available on-base is access to the Navy-Marine Corps Relief Society. This organization works to provide emergency loans and grants to its military families in need. It also schedules financial planning consultation, including its popular “Budgeting for Baby” series. Another wonderful accommodation is the on-site Family Service center. Here, Navy soldiers and their families can receive valuable resources during each stage of their tour- including relocation amenity assistance and spousal employment searches. While any number of Hampton Roads communities may grab your heart, keep in mind that neighborhoods of Norfolk, Chesapeake, and Virginia Beach require tunnel travel to Portsmouth. This means that rush hour traffic can more than double your commute time. 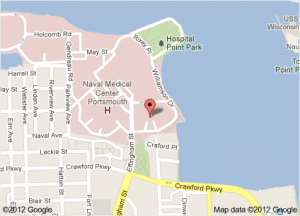 For this reason, and the overall appeal of Portsmouth, many families affiliated with the Naval Medical Center choose to reside in the city itself. The quaint port town of Portsmouth VA provides a number of appealing activities for any lifestyle. Charming restaurants line the downtown area, providing an array of exotic ethnic cuisine, traditional southern cooking, and, of course, seafood fare. Portsmouth Virginia is also home to the state’s largest children’s museum. The Bide-A-Wee Golf course has been named by Golf Digest Virginia’s best Municipal Golf Course. Shopping includes antique showrooms, art galleries, and standard hometown amenities. 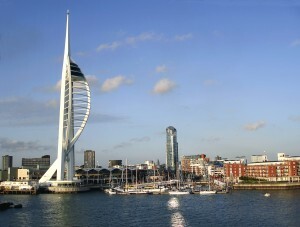 On every corner, Portsmouth is poised to impress. Also a benefit of living in-town is the wide selection of neighborhood communities. Whether you’re looking for spacious lots or neighborly friendship, there’s likely more than one area that will appeal to you. Portsmouth’s rich history is visible in the three-century old neighborhood of Olde Towne. Established in the 18th century, this is the original Portsmouth housing area. Single-family Portsmouth homes are generally available in the upper $200k’s to $400k range while Portsmouth oceanfront condos are listed in the $80k-$200k range. The neighborhood of Cradock offers a much more affordable price tag, with stunning single-family homes averaging $80k to $140k. Cradock was created in 1918 to house an overflow of wartime workers during World War I. It features over 750 homes, many of which are two story New England style Portsmouth VA homes. Park View is one of the town’s first neighborhoods and features more than 300 Portsmouth VA homes. Most are in the Queen Anne style, and have lovely towers and gables. These Portsmouth homes are a bit larger, many having four or more bedrooms, and are also costlier than single-family homes in Cradock. In Park View, Portsmouth homes can be acquired in a wide range of prices, from about $100k to $900k depending on the particular location and specifications. Apartment-style Portsmouth homes are also available in neighborhoods such as Crescent Place and The Myrtles at Olde Towne. There are many more neighborhoods in Portsmouth, and with the Stone Real Estate Team by your side, you’ll be able to choose just the right one for your family. 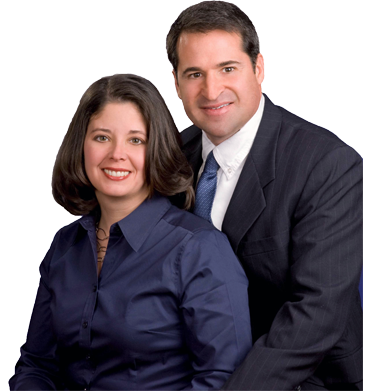 The Stone Team is a top Portsmouth REALTOR team. Their experience and dedication can help soldiers and their families find the perfect Portsmouth home without hassle. As the Portsmouth Real Estate market rebounds, the perfect time to buy is now, while prices are still at their lowest. Don’t miss your opportunity to join a community waiting to welcome you with open arms! Get started today by clicking the “home searches” button at the top of this page to find Portsmouth VA Homes for Sale, or by calling us at (757)-565-1043. We’re looking forward to helping you find your new home in Portsmouth, Virginia!